These days, I mostly try to avoid refined sugar. Mostly. Of course, it can’t be avoided if I’m inspired to bake an exciting, new cake recipe or if ice cream making is on the agenda. But, most days, I opt for savory over sweet or treats lightly sweetened with dates or a little maple syrup. This approach to sweets has been made very easy by the recipes from Good Clean Food: Super Simple Plant-Based Recipes for Every Day . After writing about this book in April, I’ve tried two more recipes that I have to mention. One of the handy things I’ve noticed about the recipes from this book is that they don’t make too, too much. You end up with a tasty treat made from great ingredients that lasts just long enough for two people to enjoy without overdoing it on sweets for days. First, I tried the Cookie Dough Bars, and they really taste like delicious cookie dough. 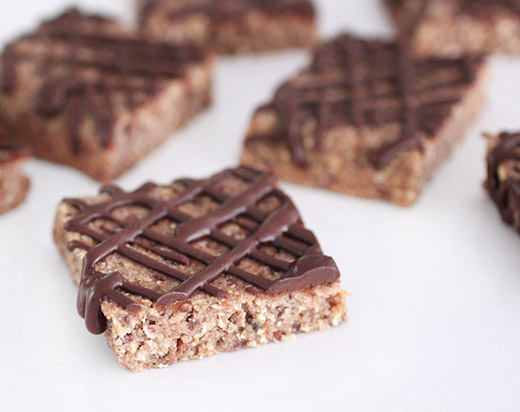 They’re topped with a drizzle of chocolate sauce that you can either make with raw cacao powder or by melting dark chocolate. 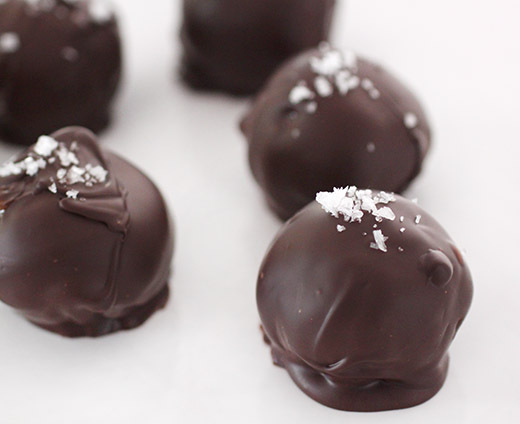 The other recipe I tried was the Salted Caramel Bonbons. The date- and almond butter-filled bonbons were dipped in chocolate and were surprisingly filling. I didn’t get quite the same sweet, bitter, salty flavors I know from salted caramel, so I might start calling them by another name, but they were great, little treats in their own right. The processes for making both of these treats are similar. For the cookie dough bars, dates were pitted and covered with hot water. In the food processor, raw cashews, oats, coconut flakes, salt, and vanilla were pulsed until fine. 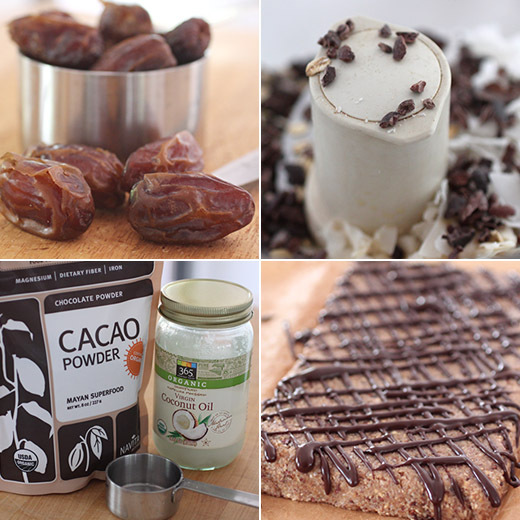 The dates were added with some of the water they’d been soaking in along with cacao nibs. The mixture was pulsed again until it formed a dough. This was pressed into a pan, and you can decide how thick or thin you’d like the bars to be. I pressed the dough into an eight-inch square pan, but only filled half the pan. The pan was placed in the freezer for a few minutes. The chocolate drizzle was made by stirring together cacao powder, coconut oil, maple syrup, and a little salt in a double boiler. The sauce was drizzled over the chilled bars, and the pan went back into the freezer for 20 minutes before cutting into pieces. The bars do need to be stored in the refrigerator. For the bonbons, dates, almond butter, a little almond meal, coconut oil, and a little salt were pulsed until smooth in the food processor. This mixture was placed in the freezer to firm up for about 10 minutes. Then, the mixture was scooped into balls that were placed back in the freezer while chocolate was melted. Each bonbon was dipped into the melted chocolate and topped with flaked sea salt. These are also stored in the refrigerator. 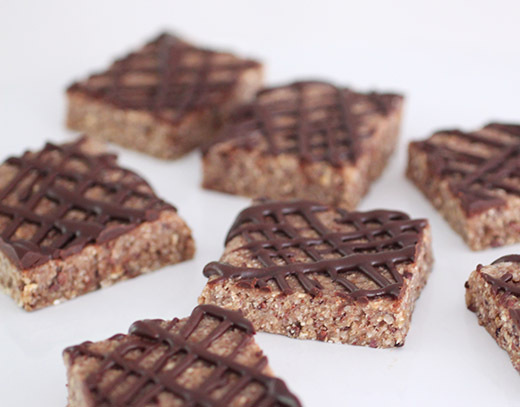 Both of these quickly-made treats come in handy when you need a boost of afternoon energy. And, both have great flavor from dates, coconut, and nuts. I know I’ll be making them again soon, and I’m especially thrilled to have learned a way of making a pure chocolate topping that’s sweetened only with maple syrup. Although, there’s probably a decadent, sugar-filled recipe in my near future too. These are calorie bombs..but at least they are healthy. So a small slice with a pot of freshly brewed coffee or tea would be perfect for me. I bet they are addictive! Such a great treat. People are really trying to cut out sugar nowadays a lot. These look really lovely though-I like their petite size! Sounds like a great book! I seem to go back and forth between eating really good and then bad. I bet these treats are delicious! These bars are so toothsome, Lisa! Yummy! if i tried to avoid refined sugar, i'd probably never eat anything! my diet in that respect is admittedly awful, but seeing bars like this gives me hope!